Don't let the name worry you. Abiotic disorders are the plant problems caused by too much or too little water, nutritional deficiencies, too much sun and sometimes just the variety. They are usually easier to fix than Diseases or Pests and often you don't have to do anything! Have you ever seen a tomato with catfacing? Some varieties, like the one shown, are just more prone to it. 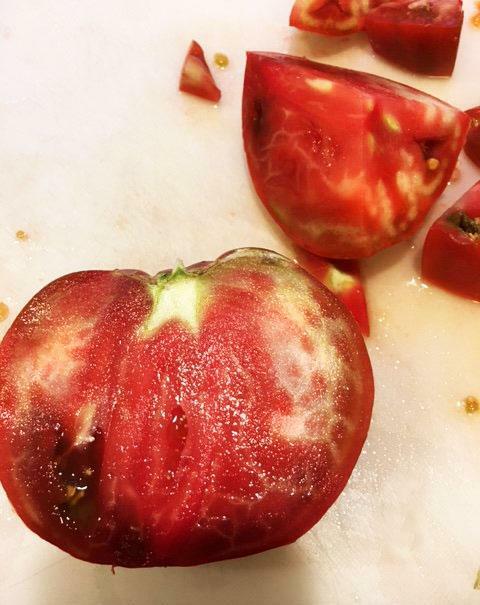 Do any of your tomatoes look like this? If so, you have blossom end rot. 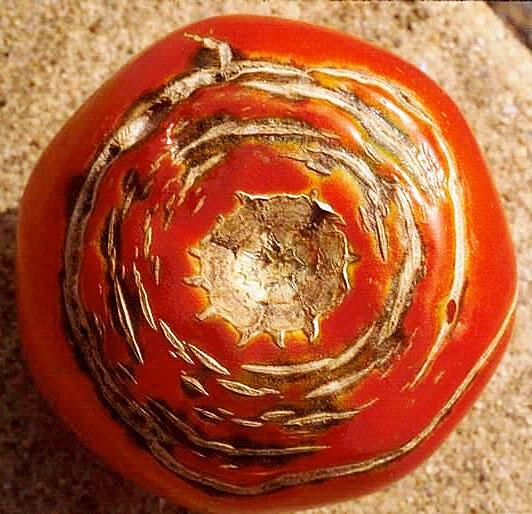 It is an environmental disorder that causes fruits of tomatoes to turn brown-black on the bottom (blossom end). 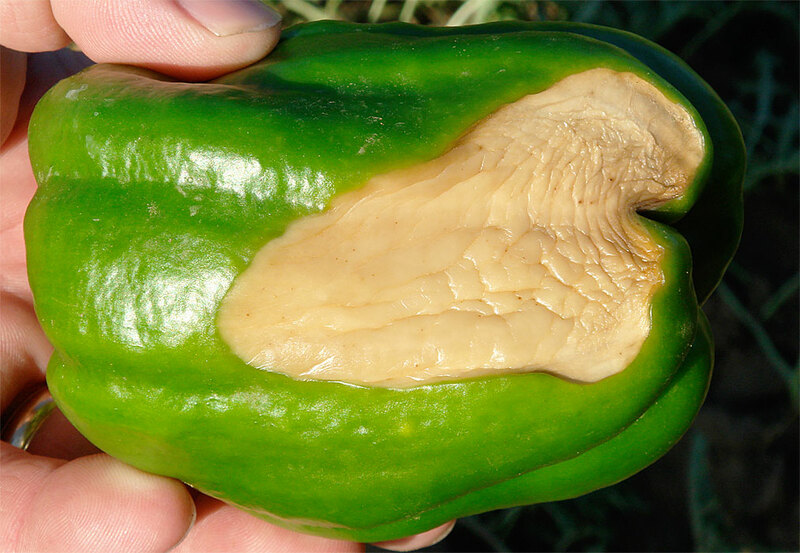 Blossom end rot can also affect peppers, eggplant, cucumbers, melons, and squash. Plants with blossom end rot show small, light brown spots at the blossom end of immature fruit (top photo). The affected area gradually expands into a sunken, leathery, brown or black lesion as the fruit ripens. Hard, brown areas may develop inside the fruit, either with or without external symptoms. The disorder is not associated with soil contact or with damage to other plant parts. Fruit with blossom end rot often ripen prematurely. Some tomato varieties, especially paste-type tomatoes, are more affected than others, and cherry tomatoes never seem to get it. Since blossom end rot is not caused by a disease, there are no pesticide solutions. Rather, it results from a low level of calcium in the fruit and water balance in the plant. It is aggravated by high soil salt content or low soil moisture and is more common on sandier soils. To reduce rot, monitor soil moisture to make sure that the root zone neither dries out nor remains saturated. If possible, water deeply but infrequently. Rather than giving plants a light irrigation every day, it is better to give them a good, long soak every few days, more or less, depending on growing conditions and the type of soil in your garden. Proper irrigation is most critical during fruit set and development. Mulching with 2 to 3 inches of materials such as grass clippings, straw, and leaves prevents rapid soil drying and allows roots to take up available calcium efficiently. Follow recommended rates for fertilizers. Too much nitrogen during early fruiting, especially with nitrogen made from ammonia, ties up calcium in the soil chemistry. Fruit is edible; cut off affected end. If fruit quality has deteriorated or if it has begun to decay, do not eat. Blossom End Rot of Tomato (PDF), The Connecticut Agricultural Experiment Station, Department of Plant Pathology and Ecology. Catfacing is a common tomato issue that has nothing to do with cats. 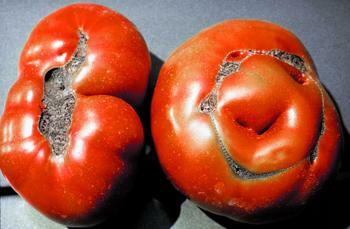 It is a generic term used to describe a tomato fruit that has a gross deformity and is usually not marketable. 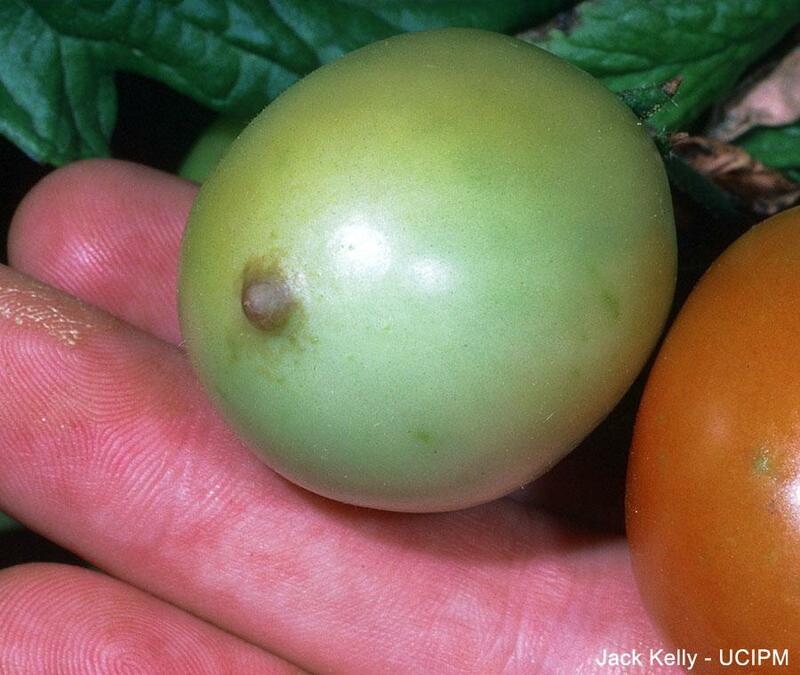 Catfaced tomatoes are generally misshapen and have enlarged scars and holes at the blossom end. The deformity is caused by something (internal or external) that occurs during the formation of the flower that results in the fruit not developing normally. There is little published information as to the exact cause, and there actually may be more than a single cause. Cool or cold temperatures that occur about 3 weeks before bloom can increase the amount of catfacing. Some varieties, particularly heirloom beefsteak tomatoes, are more prone to catfacing (one of the features that give heirlooms their charm). Heavy pruning in indeterminate varieties has been shown to increase catfacing, but this has not been shown to happen in determinate varieties. In indeterminate varieties, catfacing is thought to be related to reduction in auxins (hormones) in the plant when the growing points are removed by pruning. There is not much that can be done for control. Varieties should be selected that historically have had little problem with catfacing. Fruit is edible after removing the affected part, which can be a challenge if there is a considerable amount of catfacing. Department of Horticultural Sciences, Florida Cooperative Extension Service, Institute of Food and Agricultural Sciences, University of Florida. 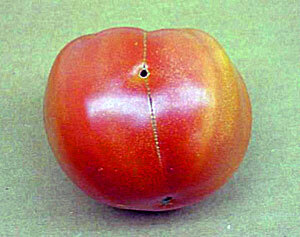 Two different forms of cracking occur in tomato fruit. Radial cracking originates from the stem end and progresses toward the blossom end (top thumbnail at the left). Concentric cracking occurs in a ring or rings around the stem scar. It is possible to have both types on the same fruit (second thumbnail). Control is through selecting tolerant varieties or by reducing fluctuations in soil moisture (applying mulch to the soil surface can aid in maintaining a consistent soil temperature). Cracking may also be reduced by maintaining good foliage cover, since exposed fruit are more susceptible. Wide fluctuation in air temperature can also increase cracking. Fruit is edible, but eat the fruit right away so it does not rot. For really deep cracks that do not contain black mold, cut away the cracked portion. If there is obvious mold, avoid eating. 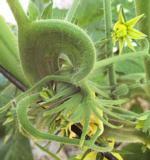 If any of your tomato plants look strange like in this photo, it is exhibiting fasciation. Fasciation is an abnormal flattening of stems, often appearing as if several adjoining stems have fused. Small stems or leaves growing from distorted stems are abnormally abundant and undersized. It tends to be more common on landscape plants, but fasciation does occasionally appear on vegetable plants. The cause of most fasciations is not understood; some may be genetic and are not infectious, or some may be caused by bacterial or viral infections. Because the bacterium Rhodococcus fascians is a common cause of infectious fasciation, manage fasciation as if it were a bacterial infection unless information is available indicating another cause. Fasciation bacteria survive on infected plants and debris. They spread in water and may infect through wounds. Control bacterial fasciation primarily through good sanitation and use of pathogen-free plants. To control fasciation due to all likely causes (bacterial and genetic), do not propagate or graft symptomatic plants. If affected plants are not removed, at least prune and dispose of distorted tissue. Pests of Landscape Trees and Shrubs: An Integrated Pest Management Guide ($), University of California, Division of Agriculture and Natural Resources, Publication 3359. Integrated Pest Management for Floriculture and Nurseries ($), University of California, Division of Agriculture and Natural Resources, Publication 3402. Fruit affected by internal white tissue usually show no outward symptoms. However, when ripe fruits are cut, white hard areas are present in the outer walls. Under severe conditions, fruit may also show white tissue in cross-wall and center of fruit. High temperatures during the ripening period in the field seem to trigger the symptoms. Maintaining adequate potassium fertilization has shown to reduce symptoms but may not eliminate them. As is common with many fruit problems, some varieties are more prone to the disorder than others. Fruit is edible, although you may wish to cut out the hard areas. University of Florida, IFAS Extension. 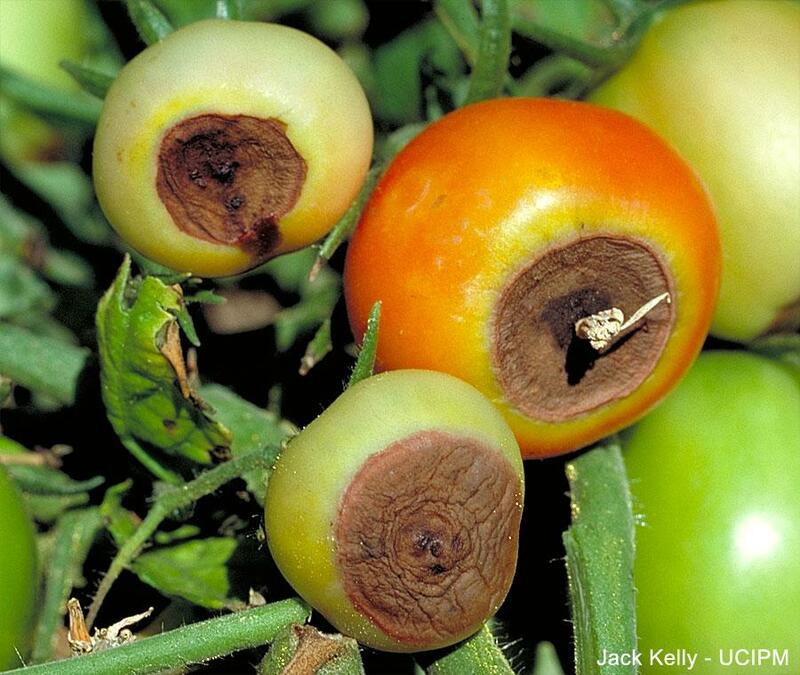 Physiological Tomato Fruit Disorders (PDF) (Gerald Brust, IPM Vegetable Specialist), University of Maryland. Curling or rolling of tomato leaves can be caused by various factors including environmental stresses, viral infection and herbicide damage. To determine what is causing the leaves to roll, look at the plant closely and make note of which leaves are rolling. Is it old leaves, new leaves, or all leaves? Also notice the direction of the leaf roll. Are the leaves rolling upward or downward? Then see if any other parts of the plant, including fruit, exhibit any unusual symptoms? On tomatoes, firm and leathery leaves are common symptoms. In wet spring conditions, the lowest leaves roll upward followed by an inward lengthwise rolling of the leaflets toward the mid-vein. The affected leaves tend to become thickened and have a leathery texture, but retain a normal, healthy green color. The tomato plant may look wilted. Heat, drought, root damage, and transplant shock are some of the environmental factors that can contribute to physiological leaf roll in tomatoes. Physiological leaf roll is very common. This is not caused by a pathogen. No action is needed, and it will not harm plants. 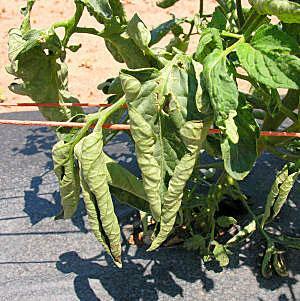 Tomato leaf roll symptoms disappear when temperatures become warmer and soils dry out. Normal growth resumes and there is no damage to the fruit that develop later. By properly hardening off tomato plants before setting them out into the garden, maintaining a consistent moisture level in the soil, avoiding the application of too much fertilizer, and being careful not to damage roots during cultivation, physiological leaf roll may be minimized. Have you ever experienced tomato plants that grow with abandon and look healthy, but there is little to no fruit? Under good environmental conditions, fruit set occurs normally, yet tomato plants may fail to set fruit for any one of several reasons. Cold nights in the spring - After several days of nighttime temperatures below 55°F, fruit set often fails in most varieties. Sometimes fruit set can be improved with the use of fruit-setting hormones available in retail nurseries. Follow label directions carefully. 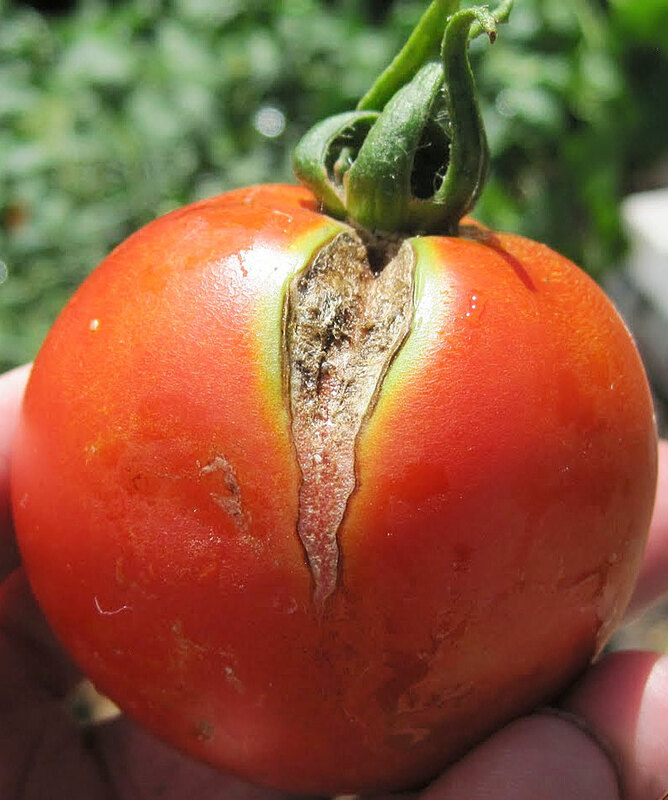 High temperatures in the summer - Fruit set failure in tomatoes also often occurs when daytime temperatures consistently exceed 90°F. Some varieties are more tolerant of high temperatures and continue to set fruit when others fail. If possible, plant varieties that are adapted to Sacramento's hot summers. A helpful source for varieties to grow are found in Garden Note 147 (Tomatoes: Suggested Varieties for the Sacramento Area - PDF). Under these conditions, it is helpful to keep the plants in a healthy growing condition so that developing flowers will have a better chance to survive. Maintain a consistent moisture supply, eliminate damaging insects, and control diseases. Fruit setting hormones are not effective in hot weather. Low light intensity - Tomato flowers may also fail to develop into fruit when sunlight is inadequate. This may occur when plants are growing under dense shade trees or along the north wall of a building. Avoid planting locations that do not allow several hours of direct sunlight per day. Best growth results where plants receive full sunlight throughout the day. Too much nitrogen fertilizer - Applying high concentrations of nitrogen fertilizer from organic or chemical sources before plants begin setting fruit causes plants to grow lush, leafy growth and significantly delays flowering and fruit set. Give plants some extra nitrogen fertilizer when they set their first fruit and every 4-6 weeks thereafter. Always water well after applying fertilizer. Smog (ozone) - Research has shown that high concentrations of ozone, a principal air pollutant during summer months, significantly reduces fruit set in tomatoes. At present there is no solution for this problem. California Master Gardener Handbook ($), Second Edition, 2015 University of California, Agriculture and Natural Resources, Publication 3382. 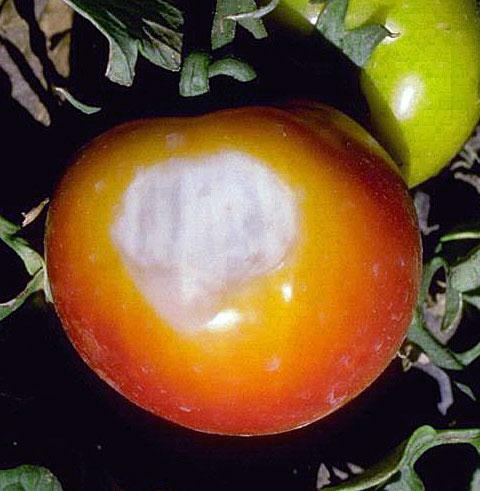 When tomato fruit is exposed to the hot sun, it may become white/tan and leathery on the surface that is exposed to the sun. The exposed areas often become sunken and wrinkled. When the fruit turns red, the leathery area remains white and sometimes becomes covered by black, secondary mold (see photo at bottom left). Defoliation caused by foliar diseases and insects also makes fruit susceptible to sunscald. Do not prune leaf cover from the plant which can expose the fruit to the sun. Maintain plant vigor with necessary fertilizer and water to produce adequate leaf cover. Provide partial shade (for example, shade cloth, burlap, or other screening material) during the hours of the most intense sunlight. Fruit is edible if the damaged portion is not too large and quality has not been affected; simply cut out that area. However, if there is black mold, discard the fruit...do not eat. 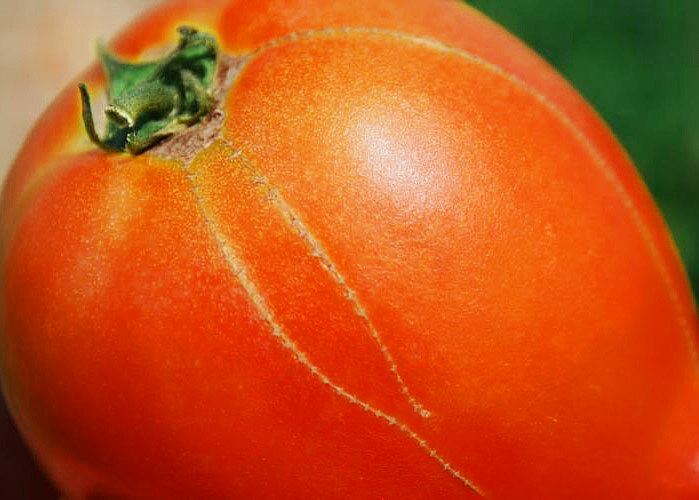 Tomatoes affected with zippering have a thin, brown, necrotic scar that extends part or all of the way to the blossom end. This scar has transverse (cross-wise) scars around it that cause it to look like a zipper. Sometimes a hole opens to the locule (small cavity that contains seeds and gel sack) in addition to the scar (bottom photo). Injury is caused by anthers (the part of the flower that contains pollen) that become attached to the ovary wall of the newly formed fruit. Scarring is more common in cool weather but can occur under other weather conditions. Cultivars vary in their tendency to get this disorder. Fruit is edible. 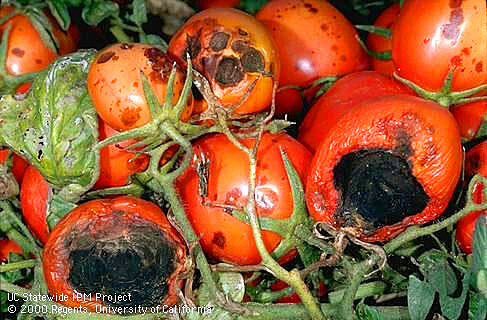 Physiological Tomato Fruit Disorders (PDF), University of Maryland Extension. Because pepper plants sometimes do not have a lot of foliage, and the fruits tend to be exposed to the hot afternoon sun, it is a good idea to provide some type of shade or screening to the plants during the hottest months of summer. While peppers like heat, they do not like direct rays of the sun on the fruit during hot weather. They can get sunscald just like tomatoes. Sunscald is a bleached or tan colored area on the fruit on the side exposed to afternoon sun. 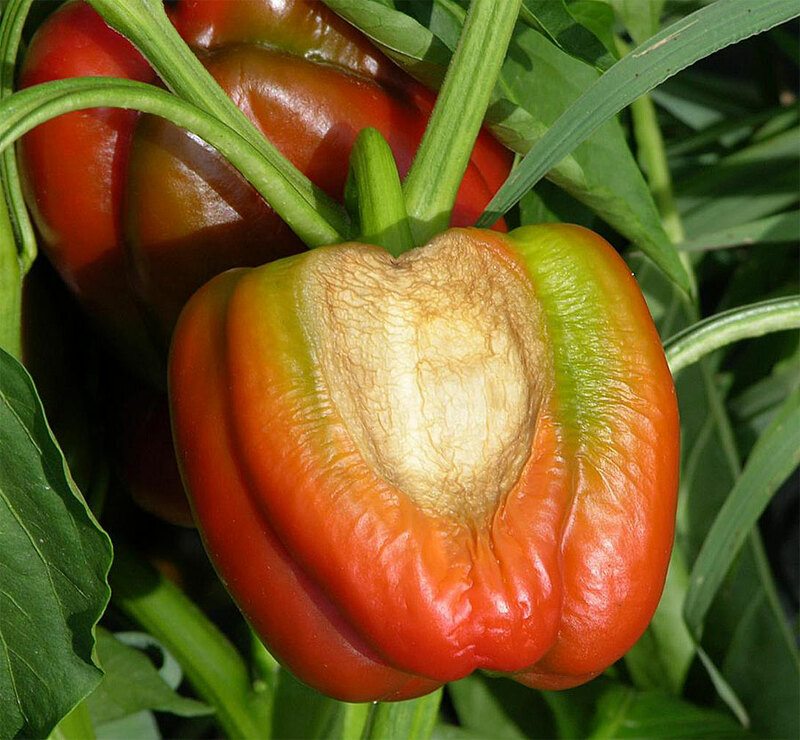 Large-podded varieties like bell peppers are more susceptible to sunscald than varieties with small pods, but small-podded peppers can get sunscald as well. Mature green fruit are the most sensitive. Maintain plant vigor with necessary fertilizer and water to produce adequate leaf cover. To protect fruit that is outside of the leaf cover, try using shade cloth (available at garden centers) attached to a frame made of wooden lath, resulting in a tent-like structure. Shade can also be provided with burlap, lightweight floating row cover (for example Agribon), or even erecting a patio umbrella on the southwest side of the plants to screen the afternoon sun. Planting taller vegetables, like cucumbers on a trellis, on the west side of the peppers is another option. 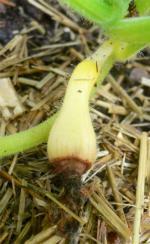 A common problem with summer squash is the rotting of the blossom end of the fruit, called blossom end rot. Plants with blossom end rot show small, light brown spots at the blossom end of immature fruit. The affected area gradually expands into a sunken, leathery, brown or black lesion as the fruit ripens. Hard, brown areas may develop inside the fruit, either with or without external symptoms. The disorder is not associated with soil contact or with damage to other plant parts. Monitor soil moisture to make sure that the root zone neither dries out nor remains saturated. Additional watering may be necessary during extended dry periods. Moisten the soil to a depth of 6-8 inches. Light sprinklings will encourage shallow rooting of the plants. The critical period for moisture is during fruit set and fruit development. Mulch with 2-3 inches of materials such as grass clippings, straw, and leaves. Mulching prevents rapid soil drying and allows roots to take up available calcium efficiently. Follow recommended rates for fertilizers. Too much nitrogen during early fruiting, especially with nitrogen made with ammonia, ties up calcium in the soil chemistry. Some varieties are more affected than others. The disorder is not caused by a pathogen; there are no pesticide solutions. Clemson University Cooperative Extension, Home & Garden Information Center. Every now and then some home gardeners experience bitterness when they bite into a perfectly good looking cucumber that they have grown for fresh use or pickling. There is a very technical reason for bitterness, but the following is a simplified explanation. The culprit is organic compounds called cucurbitacins (pronounced “kyew-ker-BIT-a-sins”) that impart a bitter flavor to seedling roots, stems, leaves, and fruit. At low levels, you aren’t likely to detect them, but high levels of cucurbitacins produce extremely bitter fruit. 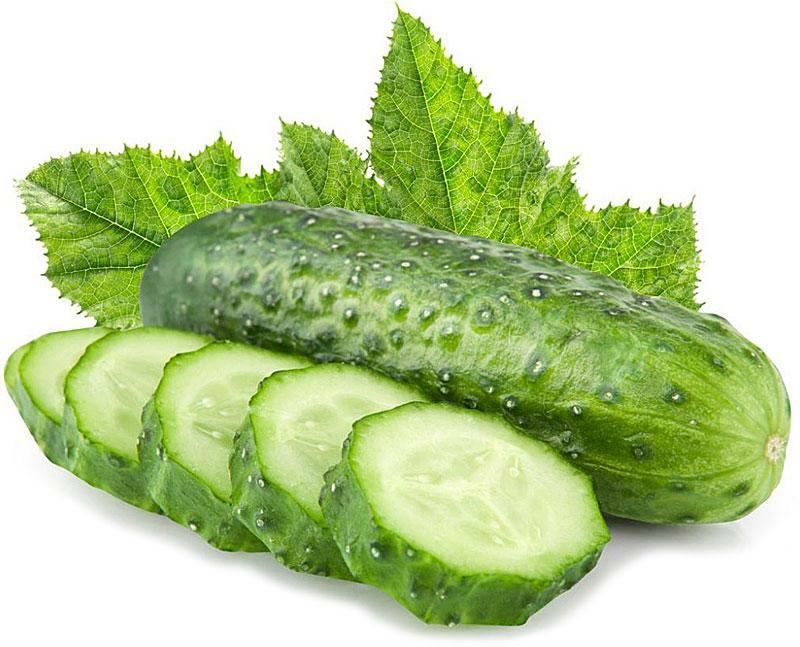 Cucumbers possess genes and enzymes that control bitterness, and some cucumber varieties possess a gene that inhibits their formation. Bitter cucurbitacins are likely to concentrate at the stem end and in and just under the skin of cucumbers. The amount of bitterness in cucumbers appears to vary from year to year and from location to location. This may occur because enzyme production is stimulated or depressed under certain environmental conditions. Cool temperatures can enhance bitterness; fertilization, plant spacing, and irrigation frequency have exhibited little consistent effect on the number of bitter cucumbers produced. Also, varieties vary widely in their tendency to be bitter. Avoid growing cucumbers in cool or shaded locations and provide uniform moisture and ample nutrients to ensure a good yield of quality fruit. Select the new hybrid varieties, as they seem to have less of a tendency toward bitterness. If a fruit expresses bitterness, it can usually be eliminated by peeling away the skin and outer flesh and removing the stem end. The direction of peeling does not have an effect on the spread of bitterness. Some of the cucumber varieties that are reliably non-bitter include lemon cucumbers, Persian cucumbers, and Armenian cucumbers (actually a melon). Once in a while you end up with misshaped cucumbers. Have you ever wondered what could be causing this to happen to the fruit? Some reasons are set out below. Poor pollination - If your cucumbers are funny shaped, you might have a problem with pollination. Pollination has obviously occurred because there are fruits, but if you have low insect activity, then the pollination process can be incomplete, resulting in inadequate pollination and only part of the cucumber becoming fully developed. If there is a lack of insects in your garden area because you have been so diligent in removing or destroying them, you might find that there are no, or very few, insects to pollinate your cucumbers. These plants require bees for pollination, and if there is a lack of bees in your area, you will have difficulties. Try planting flowering plants that will attract bees and other pollinators, such as basil, bee balm, borage, cosmos, sunflowers, and zinnias. Check out the list of easy to grow bee plants for the Sacramento region included in the Bee Gardening Resources (PDF) prepared by the Häagen-Dazs Honey Bee Haven. Temperature - Sometimes when the temperature gets too hot, it can actually kill the pollen. Bees may carry both live and dead pollen to the female flowers. The live pollen will pollinate a portion of the cucumbers, while the dead pollen does nothing. If this happens, again you will have deformed cucumbers. 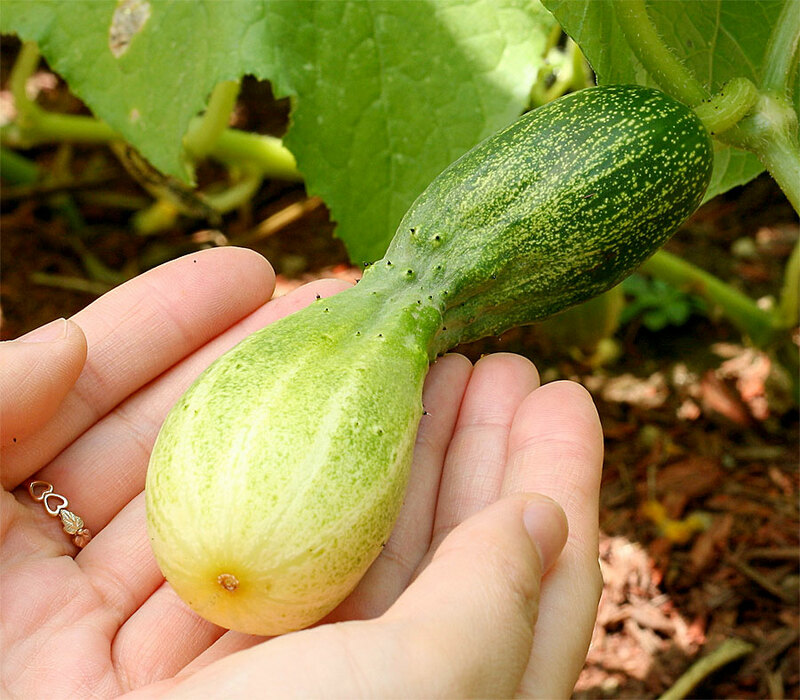 Insufficient water - Your deformed cucumbers could be caused by moisture stress, especially during hot weather. Cucumbers require plenty of water throughout the growing season, particularly during development of the fruit. Fruit Set Problems in Squash, Melons, and Cucumbers in Home Gardens (PDF), Leaflet 21242, UC Vegetable Research and Information Center.